Amazon Fire TV, online at Amazon.com, is a tiny box that connects you with your entertainment. Whether you're a Prime member or not, enjoy a huge selection of TV episodes and movies, voice search that actually works, plus exclusive features like ASAP and Amazon FreeTime, Fire TV is an easy way to enjoy Netflix, Amazon Instant Video, HBO GO, Hulu Plus, low-cost movie rentals, live and on-demand sports, music, photos, games, and more. Stop by RetailSteal.com for the latest Fire TV coupons, Fire TV promotions, and Fire TV discounts. Enjoy over 200,000 TV episodes and movies, millions of songs, and hundreds of games with your new Fire TV console from Amazon.com. Connect to digital entertainment even faster with the Amazon Fire TV stick, now just $39 at Amazon.com. Act now and enjoy a free 30-day trial of Amazon Prime when you purchase the Amazon Fire TV console. 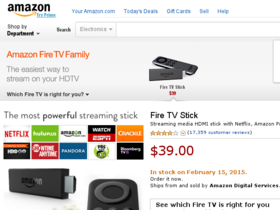 Click link to save 20% off your Fire TV from Amazon when you buy refurbished. Check out the Amazon Fire TV console, now as low as $99.